Please click on the wanted map to get to the PDF Download or to the interactive version! 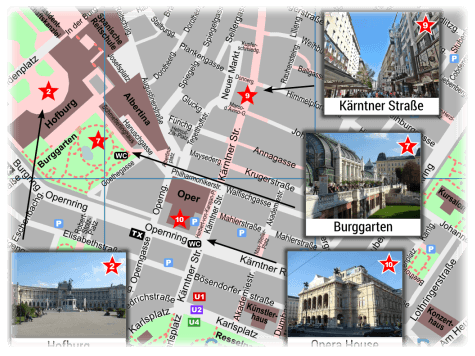 The city-walks Vienna Tourist Map gives you a detailed overview of the city center with all the famous attractions so that you can plan your sightseeing route. It is also available as a PDF file for downloading. The whole Vienna old town is pictured on an A4 sheet and due to that it is a perfect printable map which you can take along at your sightseeing tour through the Vienna city center. For all who prefer to select their destination with the help of pictures there is also a version available with photos of the most important sights & attractions. All pedestrian zones are immediately evident due to the pink color. You can find also a lot of Viennese parks and green spaces which are drawn in green color. Due to those markings it's easy for a tourist to find the most comfortable path for pedestrians through the city. It's also easy to find the sights and attractions which are marked with a star and also the brown colored special buildings on your path. If you need to go for a longer distance just use one of the metro stations which are marked by different colors. If you prefer a more comfortable way to reach your target you can also use a taxi. At the city map you can find the taxi stands marked with the symbol "TX". Also the public toilets, which can be quite useful during a long walk through the historic old town, can be easily found by looking for the "WC" symbol. Even if you come by car to the city a printed variant can be very helpful due to the marked car parks in the old town. Here you have the possibility to choose from different versions, to get the best overview according your demand. 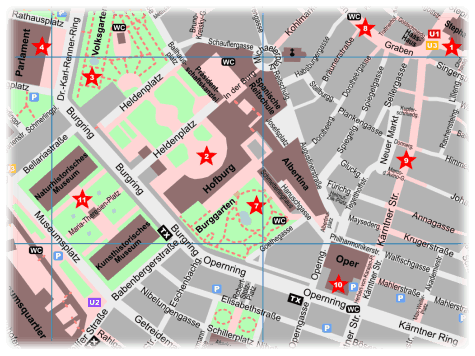 The standard view is a street map with a detailed and clear presentation. In addition, there is a satellite view or a version with public transportation. Choose from different topics like attractions, restaurants and further areas and decide yourself which pictures and texts are of interest to you. With the help of the search box you can find streets, places and many other points of interest. By clicking on the green check mark you can attach the respective info box permanently. The collected info boxes can be printed together with the map. So you can create your personal city map travel guide from city-walks.